A burst of new Wonka material is in the works. 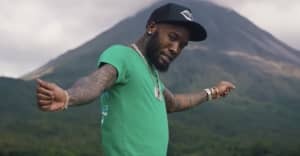 Last month, the rapper Shy Glizzy received an impressive co-sign: during a performance at the Global Citizen's Festival, Beyoncè did a quick routine to Glizzy's irrepressible hit "Awwsome." The MC returns today working with Zed Zilla and the producer Wonka. Wonka's twinkling, piano-heavy beat channels gospel's reverence, and the clean keys compliment Glizzy's textured, inimitable voice. According to the rapper, the two men have been working together regularly. "We just felt it was a good time to release the record," he explains via email, "since we both drop tape." This is the first in a series of new Wonka productions the beatmaker is putting out to promote the non-profit SafeShores campaign Santa Cause. Learn more about Santa Cause here, and listen to "Walk On Water" below. Read Glizzy's GEN F profile.